Somehow, neither of us knew very much about our country's fourth national park before going. I knew that was something called El Capitan and something called Half Dome, but that was really it. Embarrassing, I know. We even considered skipping it, until we received a sign. 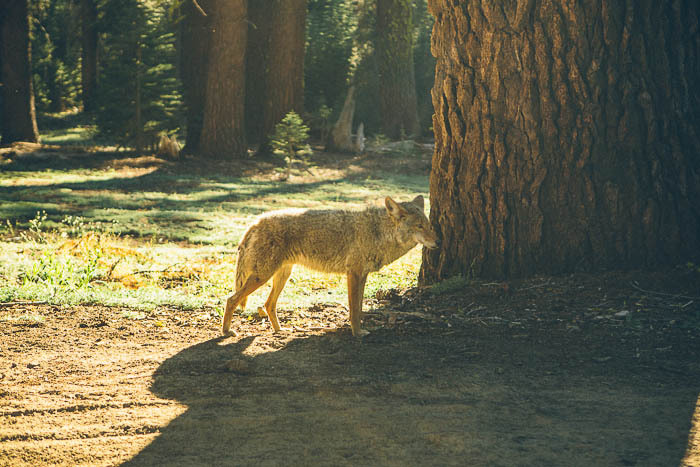 One of our campground neighbors in San Francisco pulled up to our campsite, said that she checked out our website and loved it and asked if we were going to Yosemite. We said we weren't sure and she handed John and one hundred dollar bill. 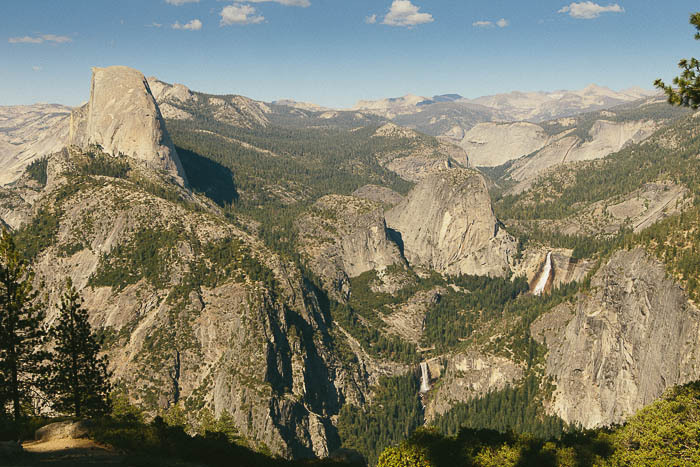 "Yosemite is the most special place in this country. My mother tries to get everyone she can to take a trip out there. Here's gas money. 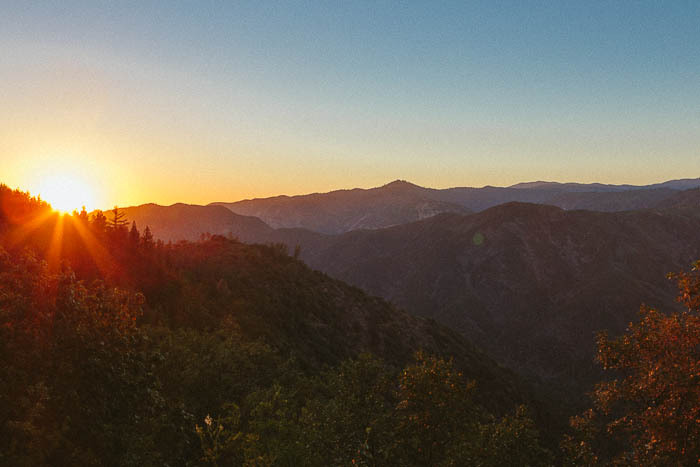 Go to Yosemite." Alright. We're going to Yosemite. Tomorrow. Oddly enough, it's probably the most spontaneous thing we've done on this trip. 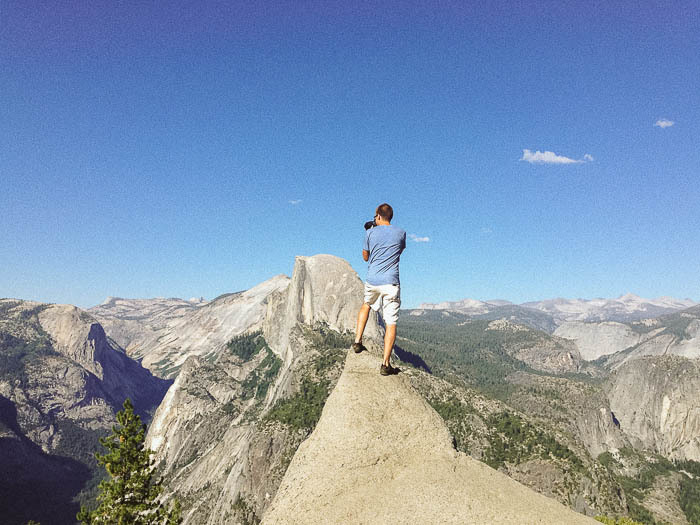 We spent an incredible day in Yosemite. 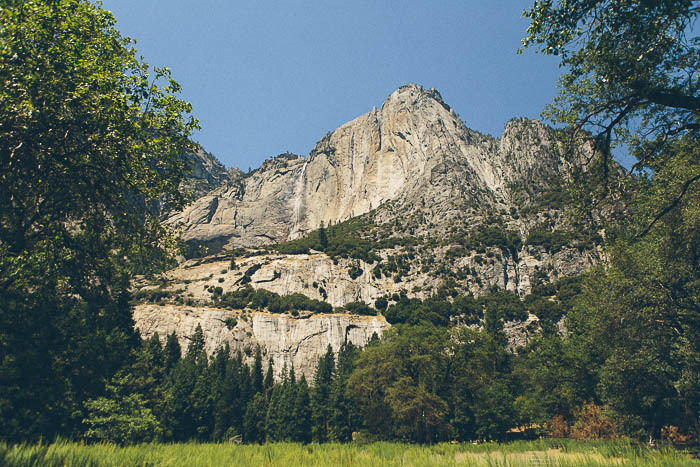 Most of our time there was spent in Yosemite Valley, driving alongside unbelievably massive exposed granite cliffs and amongst throngs of international tourists. 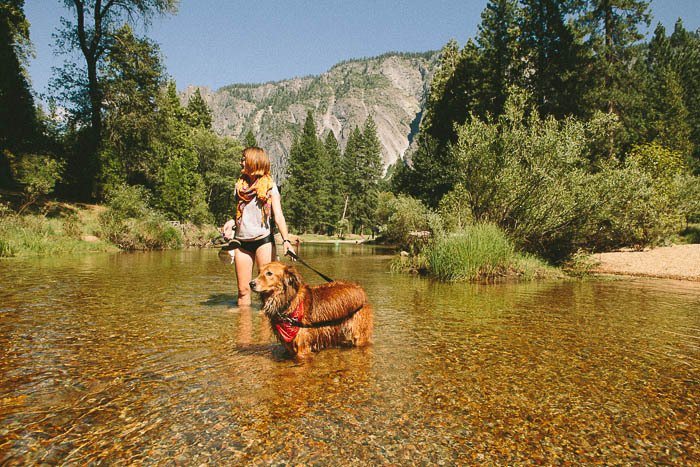 Because we brought Bulleit along with us and the NPS is not very dog-friendly, we could only go on a few short hikes within the Valley, but they led to some beautiful waterfalls and refreshingly cool rivers. 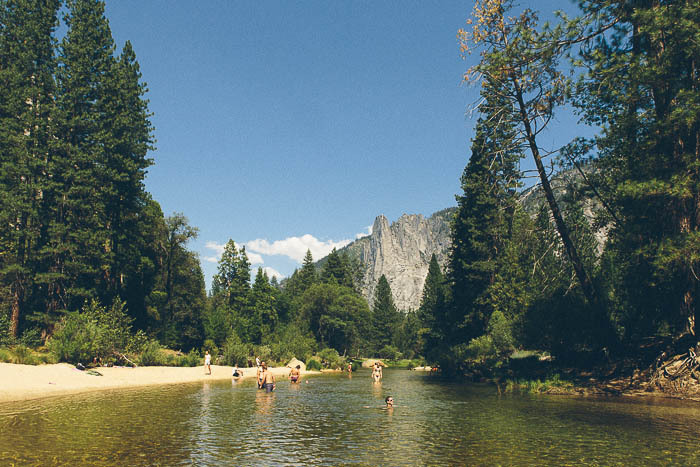 The sun was getting unbearably warm and we were hungry, so we parked along the Merced River to find a picnic/swimming spot. We spent the afternoon swimming in the cool river, literally teaching Bulleit how to swim (isn't he supposed to be a dog?) and munching on leftover homemade pizza and snacks. All in the shadow of the looming El Capitan. The sun was getting lower in the sky and we debated driving the narrow, winding road 50+ miles to the top of Glacier Point. The view was supposed to be incredible and we certainly weren't hiking the 3,000 feet to the top. Well, we weren't going to be any closer, we were gonna do it! And thank goodness we did. 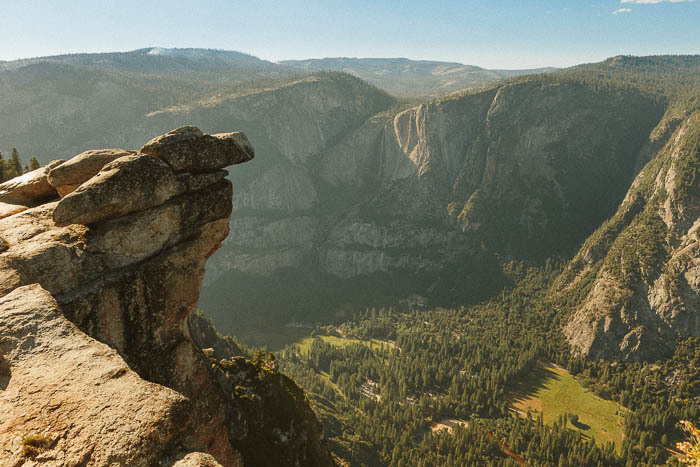 From 3,200 feet, Glacier Point overlooks the entirety of Yosemite Valley. We had spectacular views of Half Dome, two massive waterfalls behind (Vernal Falls and Nevada Falls) and Cloud's Rest. We were in awe. Leaving the park, I was only a little disappointed that we didn't spend more time exploring. Granted, it was peak season and we were poorly prepared, but stopping at each prescribed overlook to take the same photograph that everyone else was taking or "hiking" along a paved walkway wasn't satisfying to me. It felt like cheating. I would have rather gone on a lengthy, semi-grueling hike to a hidden waterfall and really experienced Yosemite's wilderness. 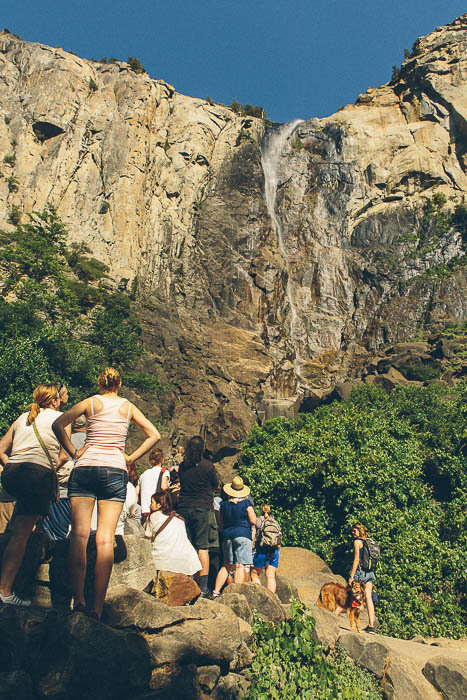 Now that we know how incredible this park is, we'll save the grueling hikes for next time. We saw a coyote/wolf! He was just chilling on the side of the road. I discovered the best ice cream sandwich in the world: It's-It. 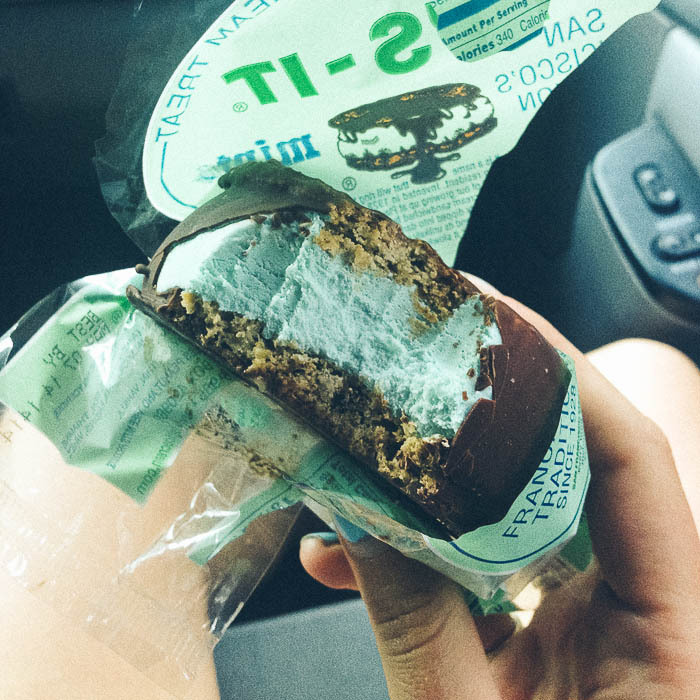 Made just south of San Francisco since 1974, these delicious babies are made of a scoop of mint ice cream, sandwiched between two oatmeal cookies and dipped in dark chocolate. If you come across one, EAT IT! 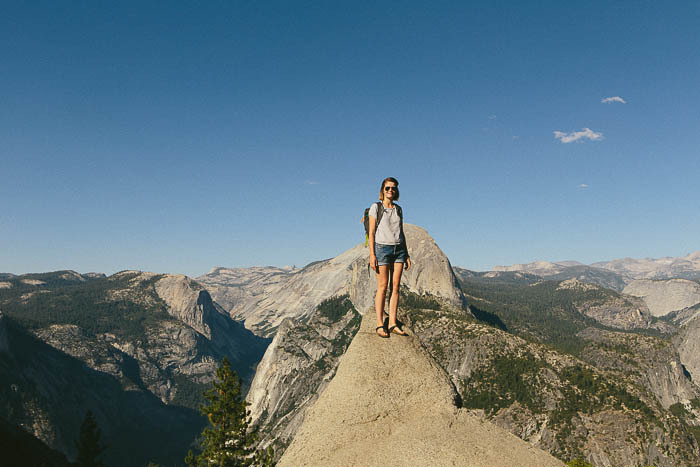 Special thanks to allison g. (who suggested See Half Dome & El Capitan) for making this blog post possible!